A great show works on so many levels, and OITNB touches upon a plethora of issues few dramas tread on. 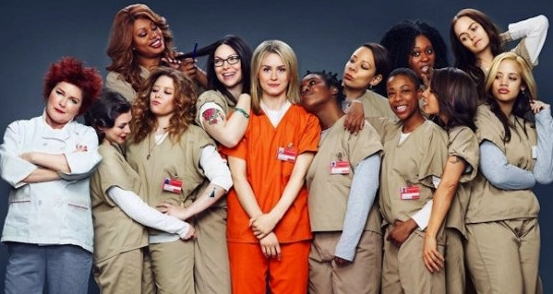 Effortlessly and ingeniously blending themes of sexuality, female friendship, identity, race, religion, psychology, redemption, fate, and corruption (especially within America's prison system), Jenji Kohan's (Weeds) behind-the-bars drama isn't as dark and heavy as you'd expect, but it's not light either. Taylor Schilling, who embodies a J.Crew-and-Whole-Foods preppiness, surprises as Piper Chapman, a traditionally pretty fish-out-of-water who reluctantly succumbs to her harsh environment; it's the most compelling de-evolution of a TV character we've witnessed since being introduced to Breaking Bad's Walter White in 2008. To see what she becomes within the first 13 episodes is as shocking as it is natural (those last two minutes of the finale were jawdropping). Backstory in a nutshell for those of you who have yet to binge on this outstanding series: Back in college, Piper became a mule for an international drug smuggler with whom she had a lesbian fling (That 70s Show alum Laura Prepon). 10 years later, she's now paying the price, a 15-month sentence in a correctional facility in upstate New York. But it's not just about her. Each player in this large and refreshingly diverse ensemble brilliantly commands whatever screen time she (or he, but mostly she) is given because they are given a well-thought-out history, which in turn, adds a mesmerizing dimension to each character. Kate Mulgrew's Red is one cunning and proud Mother Hen. Michelle Hurst's Miss Claudette is a sympathetic figure cut from the cloth of a Dickensian tragedy. And Laverne Cox lends a quiet gravitas to Sophia, a transsexual firefighter-turned-hairdresser who strikes up an unlikely allegiance with a nun (the comforting Beth Fowler). And there's more: Taryn Manning is nearly unrecognizable as religious freak Pennsatucky. 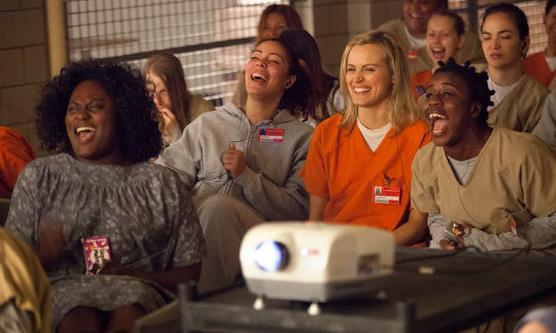 There isn't a scene the fantastic Uzo Aduba (Crazy Eyes) can't steal. Australian actress Yael Stone makes the adorable yet clueless Lorna a chick from the Bronx you'd want to be pals with. Danielle Brooks is heartbreaking as Taystee, especially when she finds herself back in prison after dealing with the unfair cruelties of an outside world no one prepared her for. And let's give three cheers for a pair of American Pie alumni, Natasha Lyonne and Jason Biggs, for being gifted with such stellar material and easily delivering their best work to date as actors. What Jenji Kohan & Co. have created is a rich and colorful tapestry that will continue to unravel with each season (there will be more, no doubt), with each character, and with each carefully plotted storyline. Congrats to Netflix for landing their best original series to date, a dynamic and nuanced portrayal of individuals who have made bad decisions, some of them luckless victims, but all of them part of a class of citizens neglected by society -- who all happen to be women. Let the OITNB withdrawal begin.